You may recall the video links I posted a while back of the band Television rehearsing in 1974. Well, the good folks at Doom & Gloom From The Tomb (yes, that’s a Richard Thompson reference) have been posting more crucial documents of the era. The first was titled Kingdom Come: The Lost Television Album. It’s a compilation of songs captured between ’74 – ’78 that never made it onto the band’s two Elektra releases. 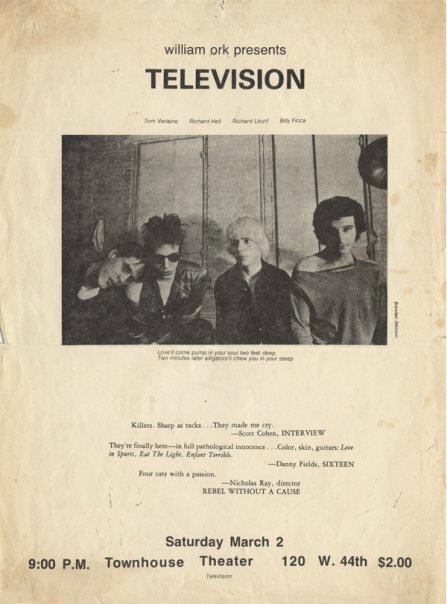 Last week, they posted Television: A Season In Hell – a set of recordings made when the band still featured punk conceptualist Richard Hell on bass. Download both while you can: they are the best-sounding and best-annotated sources I’ve found for this stuff. Thanks D&GFTT! Below: a flier for the very first Television gig, which in fact did not take place at CBGBs, but at the Townhouse Theater in Times Square, an old movie theater that the Modern Lovers had rented out for a show around the same time, as I mention in Love Goes To Buildings On Fire. Hey, thanks for the plug! Just finished your book, coincidentally — incredible work! One for the ages.